Photo: At right, the Ivar Reefer in port. So your grocery list includes picking up a bunch or two of sweet, succulent grapes for snacks, a fruit tray or for inclusion in the lunch you pack for school or work. Meet the Ivar Reefer’s Master, Sergiy Manannikov, who when not directing the Ivar to and from Chile through the Panama Canal during the course of his latest six-months contract, lives along the Black Sea with his wife and two young children in a locale where the Russian Naval Fleet is berthed. While the Ivar’s deck lifts are hoisting fruit cargo from the ship’s holds to the Gloucester pier, Sergiy finds a few minutes to relax with visitors from the Seamen’s Church Institute (SCI), and he seems to enjoy the diversion. SCI, an ecumenical ministry founded in 1843 to “host” seafarers lonely and far from home, has Episcopal, Lutheran, Baptist, Roman Catholic, Presbyterian and other denominational visitors and support. (The ministry has one Muslim chaplain as well.) The Rev. James Von Dreele, an Episcopal priest, directs SCI and has served as the Port Chaplain for 15 years. Manannikov explains it is not easy to be away from home and family, but adds that he is doing what he has always wanted to do at sea. 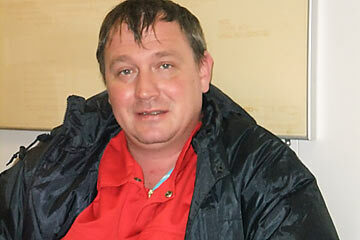 He completed his university education in the Ukraine in 1996. He entered the seafaring ranks as a cadet and then, as he tells it, gradually rose through the ranks, becoming a ship’s officer, and finally a Master in 2007. Now he is on the Chile-Philadelphia “run” and gets to the South Jersey port every three weeks or so. He is grateful for SCI guests, who offer friendship he clearly welcomes. On this day Lutheran Chaplain Bill Rex, who is on call to the Port of Philadelphia from Seafarers International House in New York City, and Lutheran volunteer Mark Staples take four Ivar crew members shopping for electronic products in nearby Deptford. One of the Filipino crewmembers buys a computer to stay in touch with family at home. 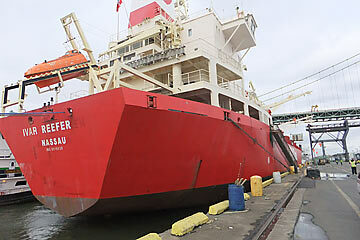 The Ivar’s visit is a small example of a global economic partnership involving international players who endure hardship and risk to deliver goods that American consumers can take for granted. Seafarers who visit the port regularly tell stories of harsh weather, piracy, injury and illness experienced aboard ship, and in the U.S. shore access can be limited by demanding work schedules or tight port security. SCI visitors are usually the only U.S. “ambassadors” who welcome foreign seafarers to Philadelphia, asking if they need anything, saying a word of thanks for what they do. In addition to grapes and other fruits, cocoa beans from Nigeria and the Ivory Coast are a major Philadelphia Port commodity because of the proximity to chocalatiers like the Hershey Co. Paper products, automobiles, gypsum, steel slabs, rock salt and fertilizer products are also imports of note to the port. Many American consumers may have the perception that the U.S. is falling off as an exporter. However, the Philadelphia Regional Port Authority (PRPA) has reported that exports to overseas trading partners increased 17 per cent in 2011 over the previous year. PRPA marketing representative Frank Camp said Pennsylvania remains one of the leading manufacturing and agricultural states in the U.S. Strong economies in some foreign markets, free trade agreements and space on vessels leaving the port are factors contributing to the export growth, he said. Three class 1 railroads and a strong highway infrastructure make for efficiency in getting goods to the port, he continues, and the port enjoys the opportunity to export considerable goods transported to it from other heartland states. Records indicate exports from the port include medical equipment, plastic products, meats, paper products, autos and auto parts, refined petroleum and iron and steel scrap and waste paper. Export partners of cargo originating in the Port of Philadelphia include Canada, Australia, Turkey, the United Kingdom, the Netherlands, France, Ecuador, the Bahamas, Argentina, Brazil, New Zealand, Panama and Colombia.